(ii) places material between two pieces of paper, which have been folded in the required manner, and presses with a hot iron, by hand. bleaches hair for wig making by immersion in solution of hydrogen peroxide, etc., to produce artificial white hair, or to reduce intensity of existing colour. mixes chemicals for bleaching straw plait; immerses material in the preparation, and withdraws it when process is complete. 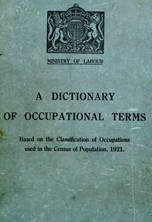 general terms for all workers engaged in processes used in connection with making wigs, false beards, moustaches, chignons, toupees, transformations, switches, partings, or other similar articles made of human hair, and including hair-net or lace making, knotting, parting making and insertion, etc. ; may he skilled in all operations or may specialise in one or two; includes chignon maker, hair-net or lace maker, knotter, parting maker, transformation maker q.v. slits knitted fabric, made on a tubular knitting machine, with hand shears in preparation for cutting (see cutter (402), and (403) ) and joining up of parts of garments. applies small heated tool, by hand or machine, to leather parts of braces, making ornamental lines round edge. covers mould or disk of buttons with linen, cloth, or other material, by hand or machine press; inserts parts of mould, i.e. , dome and shank with cloth between, in press and operates press by foot lever or swinging arm. operates band or power press which punches out cardboard shapes of peaks or which cuts cap peaks to shape by placing material under knife shape and bringing knife edge into contact with the material. arranges paper patterns on material so that cloth is cut economically, at the same time observing carefully pattern and "way " of material; chalks round edge of pattern on material to define outline for cutting of garment; usually done by cutter (402) q.v. a boardworker q.v. making chignons, a kind of roll of hair, worn on the back of the head to supplement women's own hair. measures and outs canvas into strips of exact .size required for use as endless hands supporting paper and tobacco in cigarette making machines; joins ends of strips and scams sides of strip in a hand-sewing machine. repairs, cleans up, and presses second hand clothing, ready for re-sale; cf. welling hand (419). in tailoring establishment, examines cloth before it is cut, to detect flaws, e.g. uneven thickness, faulty dyeing; passes cloth over perch, a revolving rod several feet from ground placed before window facing north, and looks through cloth against light. examines materials supplied for use in cloth hat or cap making, to discover defects. covers shapes or wire frames with silk, velvet, ribbon, etc., by hand or machine. invents new styles and models for clothing, underclothing, hats, caps, corsets, etc., adapting old styles, and often working in conjunction with skilled workers, e.g., cutters, with a view t-o considering prevailing fashions, costs of production, etc. ; sometimes cuts out cardboard models, and supervises making of sample products; sometimes specifically designated, e.g., art needlework designer, corset designer, dress designer, designer of costumes, tie designer. plaits, knots, or twists locks of human hair into designs or devices, such as worn iii lockets, or into cords, chains, or loops. designs, cuts out, and sews, by hand or machine, garments for dolls. takes piece of material, as cut or torn to form a handkerchief, and draws, by' hand, certain warp and weft threads, working to a gauge; prepares handkerchief in this way for spoke stitching, and/or forms designs in corners of handkerchief. mixes dyes, arid either himself dips straw plait, felt or cloth hats, or caps, in dyes, which arc contained in revolving vats, or supervises dyer's labourers (429) q.v. see cloth room man ; cf. examiner (401). lays rabbit or hare skins on teed table and guides between rollers into fur-cutting machine. receives partly finished helmets from cork helmet maker q.v., and trims edges smooth with sharp knife. (ii) cuttler; folds cloth for tailor's cutter, by hand or in a "cuttling" or "rigging" machine. (iii) vice folder; folds in hem after thread-drawing process, on previously cut or torn piece of material to form hem of handkerchief; cf. boxer (919), maker-up (919), ornamenter (943). cuts by hand, with shears, oblong piece of white lambskin of proscribed size, and another triangular piece to form flap; tacks a ml stitches, on power machine, pieces together along top edges; lines hack with coloured silk; sews ribbons along front, edges of apron and flap; stitches on silk rosettes, and fastens two pendants of gold or silver filigree work so as to hang from top of apron; stitches on two pieces of clastic silk to act as belt, and adds buckle fastener. makes pads of human hair matted with silk; fluffs hair by back combing; mounts hair on a cord and makes into shape required; obsolescent. feeds, and operates by means of a. lever, fur blowing hydraulic machine in which fur shaven off rabbit or other skins is broken up, mixed, and freed from dust, dirt, and coarse hairs; looks over fur carefully as it passes through various chambers in machine, and removes impurities which are held by small rollers. feeds fur skin between rollers of carding machine to clear it of dust, blood, matted knots, etc. (ii) mixes or blends different qualities of far. holds and manoeuvres flounces or frills of garments on table of a machine consisting of heated fluted rollers, which give them a pleated or fluted appearance. makes hair pads, by covering wire frames with human hair, by hand; places hair net over hair, and binds covered frame with tape by machine. cuts to shape, prepares, and fixes on block, the net foundations for wig-making. a boardworker q.v. who weaves, by hand, hair net or lace for use as foundation of wigs, etc., or for use in protection of women's coiffeures. opens and straightens hair combings by use of combs of various sizes; separates white or grey from coloured hairs, by hand. makes up plumes of horse hair, etc., used for headdresses, military helmets, etc., by selecting hairs of appropriate lengths, tying firmly at base with thread; heats glue and dips base end of plume in hot glue, which, by solidifying, consolidates the hairs. sorts, washes, bakes, hackles, turns, dries' bleaches, and tints human hair prior to its sale as prepared hair, or prior to making up into wigs, transformations, etc. weaves hair, by hand, on three threads stretched tightly between two upright sticks. applies a metal plate pattern (template) to piece of cloth cut for collar shape and turns projecting edge of cloth over pattern, with a damp cloth and hot iron, to form turn-in for seam, thus giving correct size and shape. cuts or drills necessary openings and fits ventilators, spikes, etc., on helmets, by hand with rivets and hammer or by holding in riveting machine. tacks hat lining on wooden block and covers it with rubber solution; lays on thin strips of cork, hammers them flat, and files them smooth, then dries in oven; repeats process until three layers of cork are attached; then takes cloth cover, stretches it in steam, and attaches it to helmet with rubber solution. cuts out, stitches together, and finishes horse clothing of woollen, linen, hemp, jute, or canvas materials; the work is usually sub-divided, .men cutting and finishing, women stitching, by hand or machine, and ironing; in the case of jute horse clothing, the garment is sometimes made throughout by women. makes by sewing, plaiting, etc., rosettes, ear-nets, sun-hats, etc., for horses. finishes completed articles or parts of articles by pressing them with a hot iron; sometimes specifically designated according to work, e.g., hat leather ironer; cf. presser and smoother. pulls glove on to a steam-heated hand-shaped brass instrument to shape it and smooth out creases; flattens seams with a small smoothing iron; often does work of laver-out q.v. pulls off long hairs from rabbit skins with special knife, pressed against the thumb, which is protected by an india-rubber shield. a boardworker q.v. engaged on knotting hair, by hand, into net or silk foundation of wigs, etc. hinds wire lamp shade frame with thread or other material; cuts out covering material, and sews it, by hand or machine, on to frame; stitches on bead borders, rosettes, or other decorations; cf. lamp shade maker (558) and (688). cuts cords into lengths, and loops, knots, and splices them, by hand, into lanyards. lays gloves out flat after being ironed; usually done by ironer q.v. folds by hand, or in a laying-up or lapping machine, material for tailored garments, shirts, overalls, etc., into a number of layers, determined by quantity to be cut; arranges folds as accurately as possible so as to economise cloth and to obviate missing of folds in cutting; marks out from template, on topmost fold or layer, lines for cutting; often also does work of chalker and cutter (403) q.v. ; cf. layer-up (429). sews soft or paper linings, previously prepared, into hats by hand. cuts out by press with shaped knives, and binds silk covered canvas or buckram for ball masks or dominoes; sews on tape, elastic or silk fringe, if required; in the case of character masks, uses a mould and die, and colours and attaches hair, by hand. attends customers to take their measurements; may be a cutter (403), fitter (404), a cutter-and-fitter, or a shop assistant (775) q.v., or a man employed in measuring only; sometimes travels from place to place taking customer's measurements. as for button coverer ; sometimes specifically designated, e.g. tassel mould coverer. using brush or trowel, rubs oil into fabric, before or after making-up of garment, adding drying agent if necessary, and drying in open air or in stoves. fits and sews cover on spring frame; usually also cuts out and sews together parts of merino cover; cf. opera hat maker (409). fits, by hand-sewing, spring of opera hat on to crown and brim. general term for persons engaged in fashioning millinery ornaments by sewing, embroidering or wiring fabric, spangles, beads, artificial flowers, or other decorative material. a board worker q.v. engaged in making partings for wigs; draws single hairs through foundation of net, silk, or skin so as to be in proper direction; inserts parting, when made, in foundation of wig, by hand stitching. inserts piece of material and template on gas-heated bed of patent collar and cuff turning machine, which may be either power driven or foot-driven; applies pressure by means of lever, so that edge of material projecting over template is turned upwards and inwards ready for seaming; work generally similar to that of hand turner q.v. ; sometimes specifically designated, e.g. collar patent turner, cuff patent turner. cuts patterns, by shears or band knife, and makes up into bundles; trims edges with a serrating machine. pierces cloth or other material to work a design in small holes by use of pinking tool or punch; cuts scallops on edge of cloth in same way. pleats or folds material in pleats, by hand or by pleating machine, presses with hot iron, and sews by hand or machine; cf. accordion pleater. presses finished articles with heavy irons, or in small calendering machine, or in hydraulic press; sometimes further designated according to articles handled, e.g. apron presser, blouse presser; cf. ironer and smoother. (ii) pouncer; brushes fine powder (pounce) over stencil which is pressed with hot iron to reproduce and fix design; in Manchester district, printing is done by tracer q.v. places puttee, i.e. straight piece of material, on a leg-shaped mould of perforated metal; regulates force of steam which is admitted and leaves puttee on shape to dry. cuts tabular knitted ribbing into lengths, with hand knife or shears, for subsequent attachment to top of socks, bottom of pants, etc. singes long hairs of fur off skin over gas flare. sorts cloth hats or caps into sizes, using brass gauge, and fixes tickets showing size. examines incoming skins for size, weight, most suitable use, Haws or defects. gives out leather to cutters (411) q.v. and fixes number of pairs that cutter must turn out from a given quantity of leather. smooths finished garments with hot iron, by hand or ironing machine; may be either a dry smoother, who smooths and folds articles, e.g., handkerchiefs, shirts, after they have been stitched or hemmed; or a wet smoother, who smooths finished articles after they have been laundered; after wet-smoothing shirts, folds neatly and pins skirt or body, sleeves, and cuffs, in proper manner for selling; cf. ironer and presser. examines each pair of finished gloves for defects. inspects tranks (oblong pieces of leather from which gloves are cut) after they have been punched out; rejects faulty pieces. splices loop or end of cord-rifle pull-through, which holds oily waste or other material used. dries hats in stove after planking, proofing, and blocking. slopes shirt, i.e. shapes neck, and sews in front, yoke, collar, and sometimes pocket, by hand or by machine. (ii) copies designs by tracing them on cloth, from original, by means of carbon paper. a board worker q.v. engaged on making "transformations," a kind of wig worn by women to supplement their own hair. makes tassels, by hand, forms braid into designs of knots, etc., and sews to pyjamas, by hand or by braid attaching machine. cuts out from spare pieces of leather, silk, etc., and makes bows, covers buckles, etc., for shoes or slippers, uually [sic] on a foundation of buckram or cardboard. turns ties right side out after seaming by putting over a thin length of wood, and at same time inserts lining (if any). see hand turner, and patent turner ; cf. turner-out (429). attaches green fabric lining to under part of peak of cork helmet with rubber solution. (ii) weighs wool "forms" and trims them, if necessary, with shears to adjust weight. cuts out pieces of net or gauze and tacks them together on wooden block to shape of head; sews tapes in contain places to keep foundation in shape; binds edges; passes mount to knotter q.v. forms, in millinery wire, outline of shape of hat on a shaped wooden block. sews wire, by hand or by machine, in finished hats to strengthen parts which bear strain, e.g., brim.